ICC. T20.WC-2012. Semi Final.2. Match.26. West Indies vs Australia. With an all round display, West Indies 205 for 4 in twenty, mauled over hyped Australians 131 all out in 16.4 overs by 74 runs, to set up a meeting with host nation Srilanka, for the T.20.WC-2012. West indies won the toss, and promptly elected to bat on a good wicket . Australians did not know what hit them as sixteen sixes and fourteen fours flowed out of the West Indian batting machinery, to set up a mammoth score. Leading from the front were Chris Gayle 75 in 41, Manuel Samuels 26 of 20, DJ Bravo 37 of 31 and Kieran Pollard 38 of 15. All Australians were slaughtered, with Cummins picking 2 for 36. Australians, batted poorly and did not seem to have a plan for scoring over ten runs per over. Five wickets were down for a paltry 42 by the seventh over. Wickets kept tumbling at regular intervals, and Australia could reach a score of 131 only due to some lusty hitting by skipper Bailey, who made 63 of 29. Naraine 3.0.17.2 and Rampaul 2.4.0.16.3, were brilliant, well supported by Badree 4.0.27.2, Samuels 3.0.26.1 and Pollard 1.0.6.2. When Australia lost to Pakistan in super 8, some felt that the Aussies had meekly surrendered the match to Pakistan, to keep the Indians away from a semi final slot. On seeing their performance against the West Indies, one will disagree with such a thought, as the Aussie machinery appeared a big hype than quality. 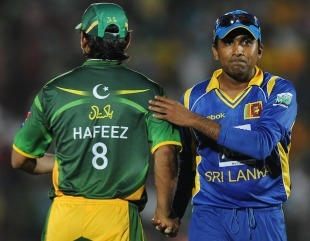 Now Srilanka and West Indies, two unheralded teams at the beginning of the tournament,would be fighting for the ICC. T20.WC-2012. The teams are equally matched. Another Gayle onslaught, will take the match away from Srilanka, and they would be aware this. Their target would be "Get Gayle early and the trophy is yours ". How true ! !